Many people are wasting their lives without knowing it. The only unwasted life is the life of a follower of the Lord Jesus. 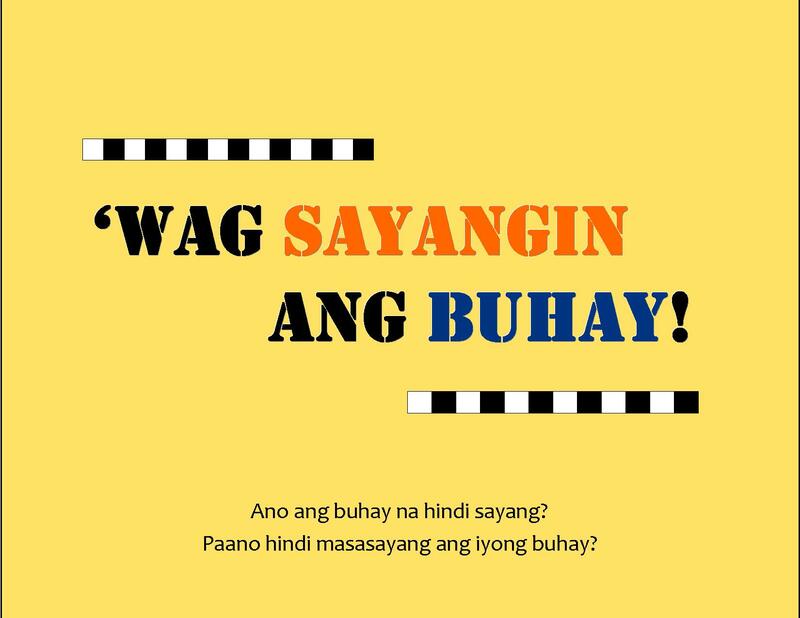 ‘Wag Sayangin ang Buhay! (Don’t Waste Your Life) is a summary of the gospel message.Use this booklet to share the gospel to your non-Christian friends. Not many people can understand the message of the gospel and its implications in just one sitting. Following Jesus is designed to facilitate an understanding of the gospel message overtime. This approach is based on the principle that evangelism is not just an event but a process. Following Jesus helps non-Christians to answer two basic questions: “Who is Jesus?” and “What is a Christian?” Jesus is Lord (Lesson 1) who died for our sins (2) and rose from the dead (3). A Christian is one who is saved by grace (4), repents and turns away from sin (5), and believes in and follows Jesus (6). This is based on Michael Bennet’s Christianity Explained. Now that you are a Christian, God saved you not just so that you will wait until you die to go to heaven and experience eternal life. God saved you not just from hell, but to himself and his purposes. First Steps is designed as a follow-up to Following Jesus. It is a series of seven lessons answering the basic questions a follower of Jesus needs to know to start walking in obedience to his/her Lord. Subjects include God’s work in salvation, living by God’s ways, listening and talking to God, relating with God’s people and the world, and living in hope. you’re welcome, bro. please feel free to reproduce it and share it to others. God bless you. We’ll be gathering driung the last weekend of October again (Friday, Oct. 28 Saturday, Oct. 29) at Northern’s, Lindner Conference Center.a0 The theme for this year is something that we feel has risen to the surface for many of us DISCIPLESHIP.a0 We’re planning to try and facilitate some discussions around how we’ve come to understand discipleship & what it’s looked like in our lives, how discipleship relates to the gospel, how discipleship plays out in the lives of our church communities, and what relevance discipleship has for the formation of our leaders.a0 Lots of great people will be presenting and provoking conversation hope you’ll come and add your voice.a0 Get all the details and register at missionalcommons.org.a0 You can also connect via the Facebook event here.a0 Care to spread the word via a web banner or a PDF flyer?a0 My buddy Ben went ahead and made that possible, get em here. To God be all the glory and thanksgiving sa buhay nyo po Pastor Derick, napakalaki po ng tulong nyo sa aming Iglesya sa feeding nyo po sa amin….sa pamamagitan po ng mga aralin na ibinabahagi nyo po…. Pagpalain po kayo ng ating Panginoong Jesus at lalo pa kayong gamitin na makatulong sa mga maliliit na Iglesya….God Bless po!!! Praise God po. Grace be with you always!